♥ Thank God for seeing me through another week. I am learning to rest in our Lord daily and find my help and strength in Him. ♥ Thank God today is Thursday! I am always reminded on Thursday to count my blessings and be thankful to God :-) So I thank God for helping me to learn to be more thankful through the participation on Thankful Thursday. "I think sometimes it takes us a lifetime to realize we are truly entitled to very little. Entitlement mentality leads to expectations. Unmet expectations lead to disappointment which leads further down the slippery slope to frustration, anger, bitterness…..Sometimes we can become overwhelmed with our current circumstances and forget the riches right before our eyes. I have found one sure fire way to pull your entitlement mind into proper perspective, God's perspective. SERVE"
♥ I am thankful to God, that like Lynn, I too have found it very fulfilling and helpful to help me think in the proper perspective by serving our Lord and His people. When I first started this blog, my motivation was to share God's goodness and mercies to me in my endeavour to understand and manage bipolar disorder and depression. I am thankful to God that He has been using this blog to help others who are struggling with depression and bipolar disorder, and even other chronic illness or sufferings. ♥ I am thankful to God that by reaching out to others who are suffering through this blog, the Lord has also enabled many people to encourage me in my walk with Him and in my endeavour to manage my illness. Thank God for all your prayers and encouragements. ♥ I am thankful to God that I can serve Him by visiting the sick and elderly in my church. Since last December, a group of church friends and myself have been able to visit some of the elderly and sick people every week. We have found much joy in sharing Christ and God's love with them. ♥ I just visited a friend who is severely depressed. It is very painful to see him sufferings in this way. I have been through so many severe depression episodes before and I know by experience how distressing that can be. I am thankful to God that He is able to deliver us from our deepest depths. I will continue to pray for my friend daily and trust that God will deliver him in His time. 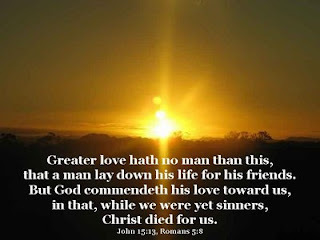 ♥ I am thankful to God for sending our Lord Jesus Christ to die on the cross to redeem me of my sins. I do not deserve God's love and kindness but God has shown such great love for me. I pray that I may be able to live gratefully and joyfully for Him daily, and give of my life and my energy to serve Him. ♥ I thank God for loving me and giving me family, friends, church brethren and blogging friends that care for me. I thank God for every one of you. May God bless you abundantly! What are you thankful for today? Thankful Thursday is hosted by Lynn. Thanks, Lynn! Do visit the other participants and be encouraged by their thanksgiving to God too. You are such a blessing as well my dear friend. God bless you. May you be blessed as you bless others! This is one of your best posts ever, Nancie! Thank you for your comments last Thursday. I am sorry I did not have time to comment on your blog but I did on mine. Things have just been so crazy lately. I was thankful for my art which helped me through yesterday. I hope to have some art posted on my blog soon. Glad you are doing so well and can be a help to others. Bless you! Take good care of yourself & don't do too much beyond your limits. Be gentle with your sweet self. Hi Karen, thanks for stopping by. Yes, we have so much to thank God for. May God bless you too! Hi Michele, thanks for stopping by. It's so good to hear from you again. I missed you so. May God bless you too! Hi Melissa, thanks for stopping by. May you be a blessing to others too! Hi Becky, thanks for stopping by. Thanks for encouragements. It's good to hear from you again. Glad your art is doing well. Looking forward to see them on your blog :-) Thanks for the reminder to pace myself! I need that reminder as I have a tendency to do too much! Take care and have a blessed day. Hi Nancie, your posts are always so encouraging and uplifting! Thank you! Pray that you will always be filled with the joy of the Lord and in it you will find your strength. I love your thankful heart sweetie. Just read your comments on my blog. Thanks so much for them;the sweet words you said and for the prayers. I commented back on mine to you there. You were the 2nd person to thank me for my encouragements. I never realized I was such an encourager. LOL Nor a strong person but I now know that I am. Today has been a good day for me thus far. Hope it is for you as well. It has gotten cool here. Chilly outside to need more than a sweater. I will probably blog more about my day later... Thanks again. Thank you for stopping by and commenting on my post. It was a joy to visit you and read yours. While I can't imagine dealing with depression, I am grateful that you serve a God who can imagine it and can walk with you through it. My heart aches for those who don't know Him and His strength. Your heart is so sweet, it's evident in what you write and I thank God for granting me the privilege of reading you. Be blessed! Blessings to you Nancie, I loved reading your post-Lynn is such a blessing to so many and it helps us get our eyes back on Jesus. Blessings Nancie...For this and so much more I am thankful!!! I'm thankful to see you posting again and that you visited me to bring me your sweet well wishes...or I may not even know that you're blogging. I noticed that I missed a beautiful one last week as well. I'm so glad that you are resting and seemingly pacing but hold Thursdays in your mind and heart for THANKS whether you are able or not! blessed & blessing others. I thank God for YOU, Nancie and all you do and mostly who you are...my sister, my friend that I have missed but glad to hear and see you doing this healing God's way and you are still being made whole! May you be more than a conqueror in each battle you encounter along the way and rise up to the victory He holds for you! I appreciate so much that you also went to MISSIONS and added your name, blog, verse, song...you are so precious! I'm so thankful I know you and Lynn also...she is a wonderful sister also and dear to me. We share our friends, healing & Jesus so fully!!! May God continually shine on you & give you His peace, strength, comfort & power to recover & press on! What beautiful, wonderful things to be thankful for! I have enjoyed reading your blog. Hi, Happy and LS, Denise, Becky, Bonnie, Nana, Peggy and Kelly. Thanks for stopping by! Hope you have a blessed week. Take care.